So what does China do with the 1$ trillion ? Right now they have invested approximately 75% in low-yielding U.S. Treasury securities and other dollar-denominated assets. The rest in euros and a small amount in yen. Returns on this investment has been less than 3% last year. Not quite exciting. But that is going to change…. China now plans to make better use of their reserves and reap in more profits. One way to do that is create an investment company, and that is exactly what they are upto. China will soon create one of the world’s largest investment funds, with diversification in global stocks, bonds and commodities markets. It is estimated that they will allocate somewhere between $200 to $400 billion to this new venture. 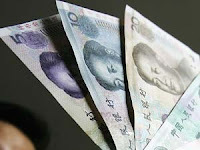 The company named Lianhui will buy 20-25% of forex reserves from the central bank for investment. China wants to invest its reserves to support an economy that grew 10.7 % last year, without causing large swings in global markets. The trade gap has increased driving reserves to a record. The surplus and China’s foreign-currency holdings have left the economy awash with cash, making it difficult for the government to slow lending and investment to curb asset bubbles. The nation is trying to slow investment and lending to curb inflationary pressures and asset bubbles in property and stock markets. The surge in money flooding in, forces the central bank to drain billions of dollars from the economy every month by selling bonds in order to reduce inflationary pressures. China intends to follow the model of Singapore’s Temasek Holdings, which manages nearly $90 billion in government pension funds and other assets. Temasek Holdings average returns has been 18%. China would love to cash in on such returns. Chinese economists have suggested China might adopt more unusual investment approaches, ranging from stockpiling oil and other raw materials to spending more on social programs in order to encourage Chinese consumers to spend more and reduce dependence on exports. Energy firms such as China National Offshore Oil Corp, China Petroleum & Chemical might be good investment grounds too. Is there a problem for U.S. ? The U.S. Treasury who is responsible for the revenue of the U.S. government will take a hit if China plans to shift its investment strategy. A hit could be in the form of less assistance to finance multi-billion budget deficits and perhaps led to higher interest rates. Is this something U.S. needs to be concerned about ? Probably not…with $20 billion a month in growing reserves, China can afford to keep buying U.S. government bonds while also channel a part into new investments. Analyst believe China is unlikely to diversify massively away from U.S. Treasuries to prevent the yuan from strengthening. The central bank buys dollars to prevent the value of the Chinese currency from rising from the inflows of export earnings. Diversifying away from U.S. Treasuries would mean selling dollars. They have a policy that they will allow gradual appreciation of the yuan, but no more than that. They don’t want to see the dollar crash. Conclusion: China is one unstoppable dragon. With $20 billion in growing reserves every month, they could diversify without affecting their investments in U.S. Treasury. By following the Temasek’s model their returns will be in double digits. That just adds more to their cash reserves. However what is still unclear is what portion of their reserves will be diversified and what kind of adverse effects that would have on U.S. markets ? Any takers ? In the world of economics, inflation is one tricky term. Everyone knows that prices go up over time. 60 years back you could buy a loaf of bread for $0.15, which now costs around $2 – $3. However not everyone understands the forces behind inflation. So let us find out. There are few variations of inflation you need to know. Deflation: When there is a general fall in prices for goods and services. This is opposite of inflation. Hyperinflation: When there is sharp rise of inflation. This could lead to a breakdown of the monetary system. Stagflation: When economy becomes stagnant. This could lead to high unemployment rate. There is no one cause that’s universally agreed upon, but at least two theories are generally accepted. Demand Pull Inflation: If demand for goods/services is growing faster than supply, the prices will increase. This usually occurs in emerging markets/growing economies. Cost-Push Inflation: If there is a sudden decrease in supply, the prices go up. This in turn increases the cost of doing business for most companies. To maintain their profit levels they in turn increase the price of their goods/services which would ultimately be passed on to the consumers in the form of increased prices. How is inflation measured ? Inflation is measured with a price index which can be thought of as a large survey. One way of measuring inflation is by comparing two sets of goods at two different times, and calculating the increase in cost. There are many measures of inflation depending on the specific circumstances. I have listed few of the widely used ones. Producer Price Index (PPI): Measures prices received by a producer/seller. PPI will give a clear indication of the pressure being put on producers/sellers. Normally this is passed on to the consumers, or producers/sellers reduce profits or they increase productivity. A subset of PPI is the Wholesale Price Index (WPI) which measures prices of goods at wholesale prior to retail prices. GDP Deflators: Measures an entire economy as the basket of goods and services, rather than some particular subset. Other note worthy measures are commodity price index & purchasing power parity. So who actually measures Inflation ? Each month, the U.S. Bureau of Labor Statistics contacts thousands of retail stores, service establishments, rental units and doctors to obtain price information on thousands of items used to track and measure price changes in the CPI. How about interest rates ? In US, interest rates are decided by the Federal Reserve. They meets 8 times/year to set short-term interest rate. CPI and PPI plays a big role in the decision making process. Generally when the interest rate drops, consumer spending increases which in turn is good for the economy. How does Inflation affect investments ? Inflation can affect/not affect certain type of investments. Let us find out which ones. To protect yourself from inflation, you can buy inflation indexed securities. However these securities are so safe, they offer an extremely low rate of return which disinterests most investors. So Is Inflation Evil ? Yes and No. People like to complain about prices going up, but they often ignore the fact that wages are also rising. The question shouldn’t be whether inflation is rising, but whether it’s rising at a quicker pace than your wages. It is evil or not depends on whether inflation is predictable or unpredictable. So to sum up if inflation is evil or not actually depends on the overall economy as well as your personal situation. Conclusion: Inflation is a sign that an economy is growing. Little inflation can be just as bad as high inflation. High inflation can break the monetary system where as lack of inflation may be an indication that the economy is weakening. I believe moderate rise of inflation is good for the economy and that is what every country tries to achieve. The goal of this post was to educate the readers about inflation in general. I hope it has achieved that goal. I also wanted to cover the relation between inflation and interest rates. I will leave it for a future date….